David Ortiz revived the Red Sox with a tying grand slam in the eighth inning, then Jarrod Saltalamacchia hit a winning single in the ninth that sent Boston past the Detroit Tigers 6-5 Sunday night to even the AL championship series at 1-all. The Tigers were cruising to their second straight win at Fenway Park, with starter Max Scherzer taking a no-hitter and a 5-0 lead into the sixth inning. 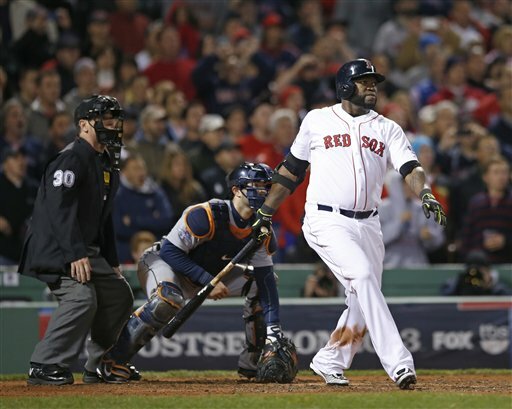 But with one swing, Ortiz changed everything. His two-out shot sent right fielder Torii Hunter jack-knifing into the Boston bullpen in a futile attempt to catch the ball, making it 5-5. Saltalamacchia’s single came after a series of Tigers misplays in the ninth. A wild throw, a wild pitch and a missed catch set up the game-ending hit. The teams head to Detroit for Game 3 on Tuesday. Justin Verlander will face Boston’s John Lackey.